How Accurate is Autoimmune Screening? Which Comes First: Thyroid or Adrenals? Great question! The short answer is both are important but the order may not be. Would you believe that as many as 20 million Americans have some form of thyroid disease? (1) It could be an underactive thyroid, also known as hypothyroidism—or hyperthyroidism, an overactive thyroid. Many people discover they have thyroid disease when they begin to experience fatigue or some of the other most common symptoms associated with the disease and go to their doctor to have their problem diagnosed. But what if there was another cause behind it all that we missed? The adrenal glands sit on top of the kidneys and produce over 100 different hormones, one of which is cortisol, otherwise known as the “stress hormone”. Cortisol literally gets us up in the morning and allows us to go about our day while accomplishing necessary tasks. Often, we can see it made out to be a villain, but life simply cannot go on without it. The main reason that the adrenals can’t make cortisol is an autoimmune disease called Addison’s disease. In some places, the rates of it have doubled since the 1960s, affecting the lives of between 93-144 cases per million1. Typically, it affects people between the ages of 30 and 502. Key Insight: A related condition, adrenal dysfunction, is even more poorly understood. And yet, one recent study showed that 57.9% of people in one sector of the working population may be fatigued due to problems with their adrenal glands3. Other experts argue that the prevalence of chronic fatigue is now coming to the forefront, but many skilled doctors haven’t had the opportunity to learn about it and its importance to their practice. A possible link between the thyroid and adrenal glands has begun to be explored in recent years. Because of the fact that so many people are affected by thyroid disease, a link could literally affect millions of people in America (and worldwide). Or, if any of the other symptoms associated with thyroid disease and adrenal dysfunction, like the ones we will cover below. Bottom Line: A connection is also important because untreated adrenal problems can only lead to more fatigue and other health issues related to the adrenals and the thyroid. Can you see the similarities? Many symptoms of adrenal fatigue actually mirror those of thyroid disease (3). Studies suggest that problems with the hypothalamus-pituitary-adrenal (HPA) axis—which connects various glands and organs in the body and controls the secretion and effect of many hormones—may contribute to thyroid-type symptoms, especially for people with thyroid conditions4. However, there are a number of elements to take into account and watch out for when treating and diagnosing you. One of cortisol’s main roles is to work in concert with thyroid hormone, too. In fact, cortisol is needed for the thyroid to carry out its job properly. Precise amounts of cortisol are essential for normal thyroid function, so it’s important that there isn’t either too little or too much circulating in your bloodstream at any one time. Cortisol also plays a key role in converting T4 into T3 (active thyroid hormone) outside the thyroid gland. If you have hypothyroidism or hyperthyroidism, it can make your body produce too much or too little cortisol, potentially disrupting the usual ebb and flow that helps you get up in the morning and fall asleep at night. For example, hypothyroidism can raise cortisol levels generally because this disease causes cortisol’s half-life to go up, and your overall metabolic rate to go down5. Hyperthyroidism can also overstimulate the adrenal glands, making cortisol levels rise for a period of weeks or months, before dropping when the adrenals cannot keep producing so much5. You may not have heard about this connection before because conventional endocrinology training doesn’t explore the link between thyroid and adrenal function. At Integrative Health, we prefer to err on the side of caution and ensure that there’s no way you might suffer from the negative consequences of the link. Key Insight: Not only can the symptoms of low-thyroid function very easily look like an adrenal imbalance, if thyroid medication is given to someone with an adrenal problem who has normal thyroid hormone levels, the medication can actually worsen the person’s symptoms instead of improving them. This is why it’s important to look at both your cortisol levels and thyroid hormone levels before initiating treatment, and why we always double check to ensure your adrenal levels and all your thyroid hormone levels are healthy. One of the best ways to find out if your cortisol levels might be affecting your thyroid function is to test and investigate both. To test for cortisol, a cortisol salivary test or “adrenal stress index” is performed over 12 hours to ensure you’re producing enough cortisol when you need it (4), and that you’re not producing too much when your levels should actually be lower. Your lifestyle and diet can really affect your adrenal glands. Here are some ways to support your adrenal glands and help get cortisol levels back in balance. If your body is struggling to metabolize synthetic thyroid hormones, you might also like to explore using natural desiccated thyroid (NDT), which includes both T3 & T4. The adrenal glands and thyroid may be connected in such a way that it profoundly affects your ability to enjoy optimum health. If you have even a slight issue with your thyroid, at IH, we recommend exploring your adrenal health. Doing so may also allow for a reduction in medication overall. Written by Dr. Roz Ranon of Integrative Health. 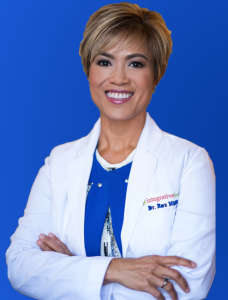 Dr. Roz Ranon, NMD is an Arizona board-certified Naturopathic Physician practicing with Dr. C at Integrative Health with a focus on Hashimoto’s Thyroiditis.